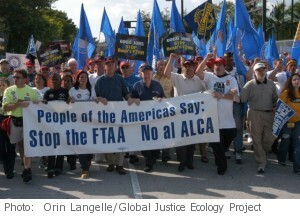 In three Ohio cities on November 18, 2003 forty-one people boarded a chartered bus to Miami to protest the Free Trade Area of the Americas. These riders came from Cleveland, Oberlin, Athens, Columbus, and Cincinnati, and the bus trip was sponsored by the Ohio Conference on Fair Trade. In addition to the 41 who made the 30 hour trip by bus, countless others flew into Miami for a show of strength by labor unions and activists. 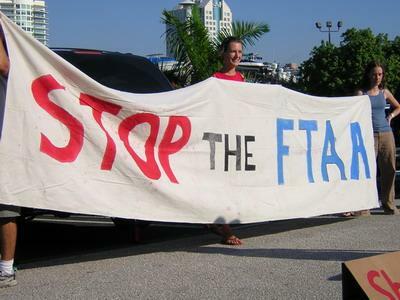 The FTAA has suffered a startling setback—disappointing to the Bush Administration, but heartening to those who have warned for years of the dangers the FTAA poses. Unable to reach an agreement to which all 34 countries of the hemisphere could sign, the ministerial delegates instead agreed that there would be a framework for an agreement, and that countries would opt in or out of specific provisions. New words surfaced, most notably the word “plural-lateral,” to describe this “buffet” type of trade agreement. 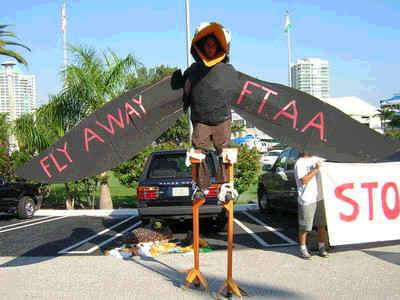 Others referred to it as “FTAA-light.” Taking the lead in opposing the FTAA as it was being presented prior to the ministerial, was Argentina, Brazil, and Venezuela. 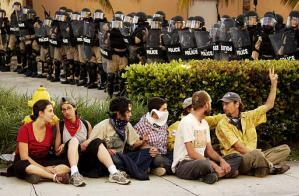 Delegates from these three nations also met with a wide cross-section of activists in Miami to explain their position. They were greeted with some protests and questions from activists who feared that these three governments were not doing enough to put a stop to the FTAA. 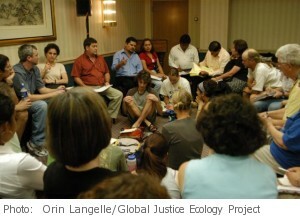 While the ministerial delegates met, the activists participated in a series of workshops. The AFL-CIO sponsored a workers’ forum featuring guests from Colombia, Mexico, Nicaragua, El Salvador and the U.S. Indigenous peoples told of the impact that FTAA would have on their communities. Students charted the course for their anti-corporate globalization work. However, at least one workshop did not go forward. Thursday morning, Nov 20th a line of riot-dressed police barred participants from entering the First United Methodist Church where they planned to attend a workshop on doing outreach around the FTAA. It was just one small piece of an overwhelming police presence that undermined the exercise of protesters’ rights of free speech and assembly. 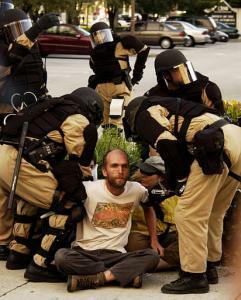 It was the tip of the iceberg of a show of force and brutality not usually seen at even the largest Washington demonstrators. With $8 million in their pocket earmarked from Congress’ allocation of $87 billion to rebuild Iraq, Miami city officials produced a major show of force. 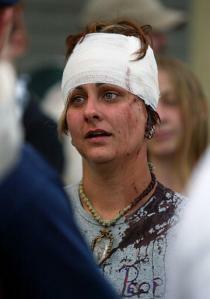 As the permitted demonstration was forming, between 9 and 12 helicopters hovered overhead, drowning out efforts to talk on cell phones. While waiting to enter the amphitheater at Bayside Park prior to the AFL-CIO-led permitted march, casual conversations were disrupted when police suddenly grabbed two protesters, one of whom screamed, “I didn’t do anything.” The police pointed a weapon directly at one of the young men they were arresting, while tying plastic handcuffs around his hands. This was only the beginning. 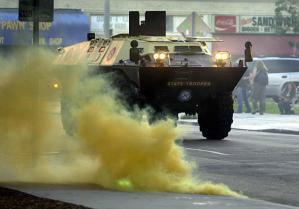 Repeatedly over the next 24-30 hours police would respond to linked arms with arrests, tazers (supplying an electrical charge to the body of the person confronted), tear gas and pepper spray. Protesters who attempted to disperse when ordered found themselves being chased by police. One Ohio bus rider in a group chased by police acknowledged how grateful he was to a family who had taken him into their home until the police were gone. Woven through the drama of these few days was a strong thread of principled goodness exuding from a United Church of Christ congregation, whose members took us into their homes, provided food and invited us into their own congregation’s discussion of the FTAA. Somehow those simple acts added a human dimension to the Miami experience that I will long remember.